A new year, a new call sign, and a new radio. I have been working on this radio for several months now. I think I can reduce the weight a little more still, but it was time to give it a go. Before the sprint, the radio only had 2 contacts on it. I was surprised that one 350 mah Li-Po lasted the whole contest! Sending with an itty-bitty straight key is tough. I started out on 20m, but there was nothing to hear, 20m was closed for my location. Switched to 40m at about 0215 UTC, and the first station I caught was W1AW/4 in NC calling CQ. Also caught a PV8 down low, and 4 Spartan Sprinters in MS, TX, MD and CA for 6 total before giving up on 40m. 80m was a little rough, but I was able to pull out 7 Spartan Sprinters in TX, TX, GA, CA, OK and TX before working all I could on 80m. With about 10 minutes left, I went back to 40m and caught one non-sprint station in KY calling CQ. I hope the bands are better next month. Just running the new KX3 through the paces. Wished there would have been more participation. Will try next month. With amazing SFI tonight, I expected signals to be louder but happy for the contacts and the chance to work both old friends and new tonight. First sprint for me in a while, first with my new KX3. Conditions didn't seem that great tonight--had to work to pull out some weak signals. Love the KX3 receiver, Though! Thanks to everyone on the air tonight! First try at Spartan Sprint. Lots of fun. Rig was K2 at 5W to a wire fan dipole up 30 feet. Key used is an old Navy flame proof. Made 2 contacts on 20 meters, 8 on 40 meters and 12 on 80 meters. It was interesting to work several old friends. Counted K4BAI and WB5BKL on 20, 40 and 80 meters. SP was fun this month with signals up better than usual. I didn't try 20 but started a bit late (again), so I went to 40 and then down to 80 around 0300Z or so. Good signals from K4BAI on 80 considering all my local noise. W5ACM must have been running his negative two ounce rig suspended with helium balloons! I would like to get an ATAS someday. My 40/80 inverted L seems to be holding out but could use more radials. Never enough radials. 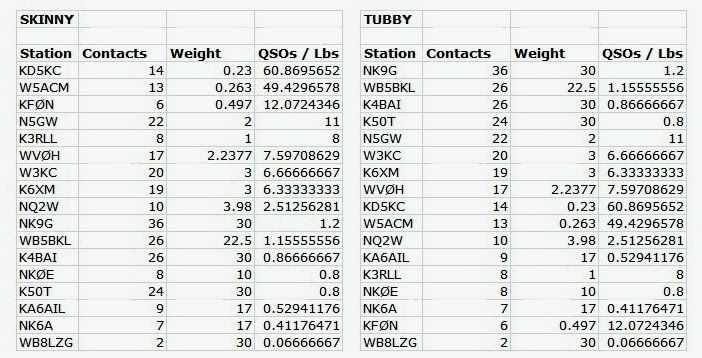 I had 17 QSOs with a station weight of 2.2377 lbs. I think it was 2006 or 2007 when I last was in a Spartan Sprint. Can it be that long ago? Nice to work some familiar calls along with some new ones too. Thanks for the QSOs. No one heard on 20. QSOs were pretty evenly split between 40 and 80 with several two banders. Many familiar calls and a few new ones. I always enjoy working the QRP fraternity. Thanks to all for a fun evening. FT1000MP, 5W, dipole, inverted vee. 20M seemed dead at the start of the Sprint except for one Antarctic area station down the band. 40M was long at the start and went longer. Worked everyone I heard except W3KC. We called each other at different times, but made no QSO. Nice to work three CA stations on 40 and one (K6XM) on 80M. 80M was good to everywhere, but there was no activity heard there in the first hour and every one heard there was worked. Totals by band: 40: 12. 80: 14. Thanks for all QSOs and Happy New Year to all. K1 at 3W with internal ATU and 80/40 board, 800 mAh LiPO battery, Sony headphones, micropaddles, CFZ over big oak limb apex at 50' in inverted vee config. Bands in fair shape, very quiet after big cold front. Battery went down after 1 hr 20 min - next time use 2W and H&P. Good night to be in the shack with wind howling and temps diving. Contacts about evenly distributed between 40 and 80 meter bands with nothing heard on 20. Using IC-703 and zs6bkw doublet. batteries survived the abuse, but it was close. As I have noted before, there are no protection circuits on these batteries (extra weight). If you run them down below 2.2 VDC each, they die. I was down to 2.7 VDC per cell at the end. Always hoping for more 20M ops! Wow; an astonishing six QSO’s! I ‘m not sure if activity was this low or my local noise level of +10DB over S-9 covered up most of the guys! If I missed any of you, I am so sorry, but this was probably the reason. I guess from now on I’ll have to put ye old noise canceler ahead of the ATS-3 but I hope I don’t have to include the weight of the thing! Hi, Hi. Conditions seemed decent though. I was able to work both east coast (K3RLL, Florida) and west coast (K6XM, CA) with the 3-watt peanut whistle which surprised me. Thanks to both of you for pulling me out of your local front-end mud! It was a great contest, though, and I hope to see more the gang in February. I had a S5 noise level on all bands. Could only manage 7Q's and five states. I could only hear a few stations out here on the left coast. All on 40M. K1 at 5 W to an inverted vee at 40 ft for 40 m and a ground mounted, home-brewed, near bottom-loaded vertical for 80 m. Realizing that 20 m would most likely be empty at the start of the sprint, I decided to by-pass my tuner and use the K1's internal keyer to more than halve my station weight. Definitely stepped outside my comfort zone. My homebrewed paddle acted up occasionally and the band conditions weren't that great so, needless to say, it was a challenging sprint. 6 Qs on 40 and 4 on 80 were completed. Had two-banders with N5GW and K5OT. Almost had a two-bander with K4BAI but I never heard him after my exchange on 80 so I don't know if he copied my info. Wish we could rattle up more activity...hope to see everyone next month ...invite a friend! K3/10 @ 5W to a 20M wire delta loop, a 40M dipole or a 40M EDZepp. 11 states this time. Tried 15 but no luck there. Worked only two stations on 20, 40 and 80M: K5OT who is pretty close and W5IQS who is even closer. One station reported 80W (I didn't count him), another 4W and four others 3W. Best signal by far was WA8ZBT. My thanks and a HNY to all. Had fun. My first time on this sprint. Had a great time, and will try it again next month. FT 990 @ 7w to dipole @ 35ft.